Question: can food intolerances partner up with the Fooducate? Two best food apps right now. Great for learning the basics and eating on the go! Love that they have this app to help my daughter with her fructose intake. But they need more food on there. Like Granola, gram crackers, coconut water, red potatoes. And more. The app needs an update on more food or a way to have a scale to figure it out our selfs. I could not love without this app. Actually have been able to plan meals better and shop more freely due to having immediate access to food aversive information. Thank you! This app is absolutely amazing. In addition to the lactose intolerance I’ve always had, I was just diagnosed with fructose malabsorbtion. Unlike with lactose, I found it very complicated to figure out which foods have excess fructose. Many are not so obvious. I have books at home but I always find myself stuck when I’m out and about. This app not only tells me if I can eat it or not, but also explains it nicely by discussing oligosaccharides, disaccharides, Monosaccharides, and Polyols. It’s priceless. Dairy, fructose are out for this histamine intolerant girl. This app has saved me many times. My favorite part is that I can customize the things I've found to be ok or put comments in. Since everyone who suffers from these afflictions is just a little different, this app is an amazing reference to have. This app has everything you need for quickly assessing if the food your considering will trigger you. It's complete with color coding, and cross referencing for every kind of allergy trigger. It found foods to be cautious of with my latex allergy as well. It also has a way to add glycemic load potential of your body building. So glad I bought this, makes shopping so much easier and the coding is customizable for your unique body. Wonderful!!! Best app out there for managing HIT. Makes food shopping easier (plus you can create a list - very handy) and more chances of a nice time eating out. Great features, color filters easy to use. Good customer support when you need it. The idea of this app is amazing. It has tons of foods and lots of uncommon foods as well. What would really make this a 10 star app is if the nutrition content section (for example, the fructose content in my case, with fructose malabsorption) were displayed per serving size rather than per 100mg. It's already color coded as high to low fructose content with little explanations, so that's pretty great, but i know that when trying to calculate the rough amount of fructose in two cloves of garlic or a single apple would be tough without a scale (I don't have a kitchen scale and I'm more familiar with US style serving sizes rather than gram amounts even though I don't even live in the US). I'm sure that would take a ton of inputting but I'd praise the developers and would definitely pay extra to have that as an extension!! This would be a 5-star app IF it had the feature of letting users add custom/new foods. Until that time, I'm forced to use a similar app that is not as good, because I can add additional foods I'm intollerant to. When this happens and I can do that, I'll be back and will give it 5 stars!! This app is a must-have for anyone with diet restrictions. It is the best app available. Perfect for those with more than one food restriction. I love being able to use it off line too. I am so thankful for this app and my health depends on it. This app has a lot of good information. 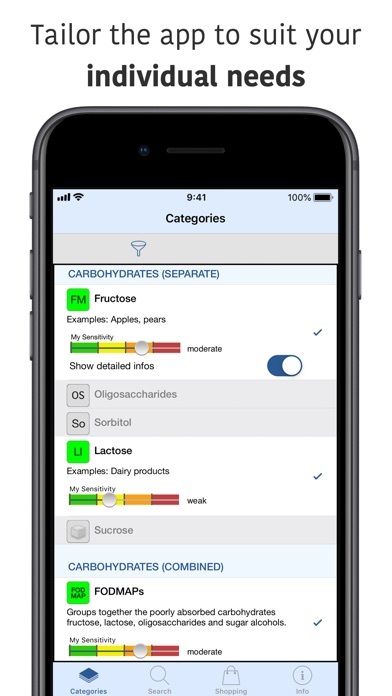 This is an amazing app for people on the low FODMAP diet for fructose malabsorption. It is very clearly designed and thorough, with clear color -coded ratings and space to add your own notes. For example, mushrooms only occasionally are problematic for me, but the app just warned me that shiitake have much more mannitol than others, making them worse. Good to know! Two small complaints: occasional German spelling and words, and a broader list of common German foods than someone outside Germany would need. Also, you have to pay extra to have the ability to change the rating on a food that you tolerate better or worse, but I thought it was worth the $3 upgrade. Get this app! You'll be glad you did! Can't live with out this app! Very user friendly and well researched. After being diagnosed with Histamine Intolerance, it was SO stressful figuring out what I could eat without having a reaction. This app takes out all the guess work and educates you. Easy to use on the go. I am so thankful to have found it! Got this because my wife has to avoid high fructose foods and the like. This app lists foods as being acceptable when they are absolutely not. i,e: It says sweet potatoes are allowed but they are actually forbidden on these diets. Such discrepancies could and have caused major discomfort to people who need to know exactly what they can and cannot eat. Do it the right way and go visit a dietician instead. You've really helped me out, thanks! Not really useful to me because it doesn't include FODMAPS, even though it showed up in the app search for them. I also don't like the fact that they up sell you for additional allergies once you get the app. Wonderful app--very helpful and informative! A family member with IBS cannot tolerate lactose, fructose, sugar alcohols (sorbitol) and gluten. I cook and bake with dextrose. We are introducing new foods (yams, green peppers and zucchini) and avoiding others (kale) thanks to this app. The developer also earns big kudos for being responsive to suggested additions. Highly recommend! This app. Is excellent. Very well organized, user friendly, and accurate! This is a must have for anyone who needs info. about what foods can be consumed by people with a variety of food intolerances. Well done and thank you to the developers of this app. Very thorough and useful. I always use this app to look up "safe foods"
Gluten intolerant? Look no further. The other gluten-intolerance apps out there are either very incomplete or non-searchable, which makes them practically useless. This app is worth its price for the gluten coverage alone, but with is complete detail re: LIT and FIT is priceless in its overall utility. This app is fantastic for when I'm shopping or eating out and trying to work with my histamine intolerance issues. It tells me what foods and medicines are good and bad, by degree, and the reasons for it. It also warns me when foods contain substances that often cause migraines, which is great. It uses info from the EU, which is much further ahead in understanding HI than the U.S. It's easy to customize for different intolerances, like gluten. Very pleased with this app! Great app, would love to see more filters! Overall this is a great app for combining various food intolerances into one comprehensive guide. Very useful! For future updates, I would love to see the available filters include a more detailed breakdown for those following a FODMAP diet. 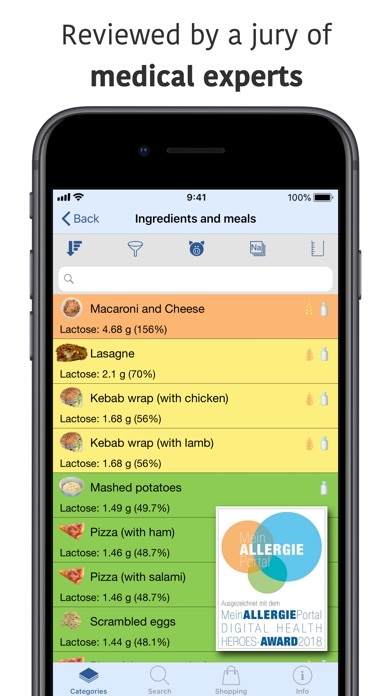 Right now this app groups FOFMAP foods under two categories (fructose & sorbitol intolerance), but doesn't provide a filter for oglios or polyols like the Monash University FODMAP app does. I would also love to see Tyramine as an available filter as well. Right now tyramine info is buried in the comments section as opposed to being a separate filter. No other nutrition information source is as reliable, informative and accurate as this one. We all suffer to some extent from food intolerances, and if it wasn't for this app I would still be sick and confused. They break it down to scientific terms, not just "this food is bad for you." It's not influenced by the food industry (I've read about 20 books on alternative nutrition, food intolerances, paleo and food politics) whereas I find about 95% of information in books and on the web is. (It's probably because this app originated in Europe?). This app will save your gut, your health and maybe your life. The only thing this app fails to make clear is that with lactose intolerance, you can drink raw milk, and although soy is mentioned as an allergen to some people, it fails to mention the phytoestrogen content that screws with everybody's hormones (and the other foods it's in like flax). This app is well worth way over its asking price. I'd pay $100 for it if I had to. Not useful or user friendly. Don't waste your money. I purchased the app and the allergen in-app expansion and now I can see what foods might be causing my issues. I LOVE the option to change the food color coding yourself. For instance most beans are a yellow food for me but I know I feel awful when I eat them so I changed them all to red. This will really help me when shopping at the grocery store, especially when looking at food additives. I can never remember which ones to avoid on my own. Great tool to help me develop a customized eating plan based on my particular allergies/intolerances. Love it! So thankful for this app! My two year old has FM -- we are so thankful for this app -- we use it every day. It's smart, extremely easy to navigate, and well researched. Thank you for making restricting a toddler's diet easier. This program is not worth the money! It is very limited in the allergens it allows you to select. This app is very informative w/sugar breakdown of natural foods which helps me a lot. Very easy to use categories as well as 'All' items if you cannot locate one by category. Also has some information and explanations for potential issues on certain foods. I'd love to see more info for every food listed! Thanks for a much needed app! This app has helped me keep healthy! Now if we could only add recipes! Awesome! Thank you so much. The info on histamine/amines is great. The best is the ability to highlight specific intolerances & severity to personalize!!! It's easy to show others so they can understand that I'm not just picky or difficult! A Fodmap diet is tough to figure out, but this ap has made shopping and cooking much easier. Plus the support is great. I had a request on a food item that wasn't included and the designer responded VERY quickly and asked me to send him a list for inclusion in the next update. Keep up the good work!!! This app is extreamly helpful for any with food intolerance. All in one place and less confusing than what u can find on different websites! I am HIT and lactose intolerant so this app has become my shopping companion! This app is not worth purchasing. Limited foods and filtering. Came up under FODMAP and doesn't work well for that. 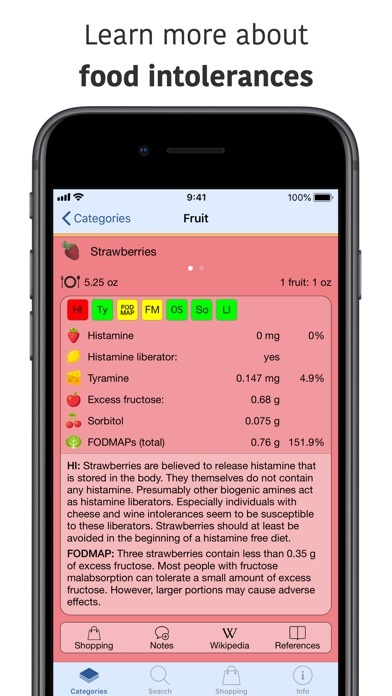 This app is the only one I could find that gives me detailed info on the fructose content and the fructose/glucose content of foods. I also had questions about the app. The app developer responded very quickly and was very helpful. Took a flier on this app for $5.99. Seemed like a lot of money but very well worth it. Discovered information I couldn't find on my own on the Internet. Breaks down the amount of allergen in each food so you can tell how badly it may affect you. Thorough and complete list of foods although skews a bit towards European delicacies. But all the major stuff is there. Organized lists with filters to tailor to your needs. I need to avoid lactose and sorbitol. I can scan for foods that only contain these ingredients. Plus the developer is responsive to your questions or comments. He is very friendly and helpful. Where do you get this kind of service for an app? 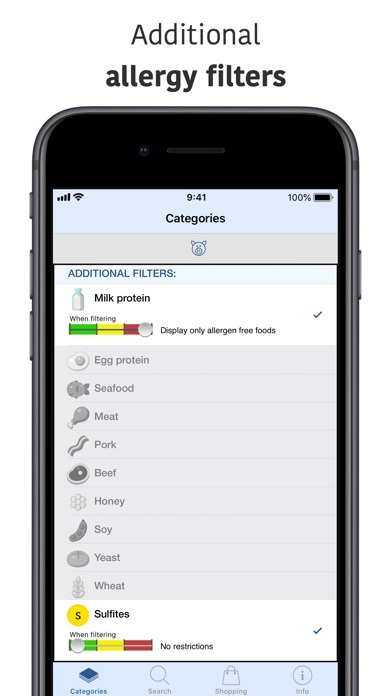 If you have major food sensitivities, this app is a treasure chest of useful information. I read other reviews saying this was more useful than the main FODMAP one, but I don't find it to be more useful. It's just a list and doesn't contain much else, at least not much that I couldn't find via a quick google search.